Property management companies and rental property owners approve the most qualified tenants through CICTotal Manager™’s tenant screening, now discounted for software subscribers. The software provides nationwide criminal and eviction history, as well as a full credit report with FICO and the option to include a decision model. This gives users the security of knowing the history of each tenant they place. Contemporary Information Corporation™ (CIC™), the nation’s leading provider of background screening, has unveiled more information about their property management software, CICTotal Manager™. Powered by Rentec Direct, the robust software platform includes CIC™’s fast and accurate tenant screening, enabling subscribers to connect with the most qualified tenants quickly. Included within the property management software solution is a professional website builder, complete with tenant and owner portals. 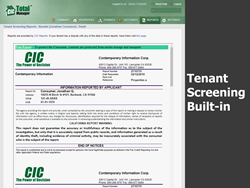 With the rental application available directly online through CICTotal Manager™, subscribers are able to get their applicant’s tenant screening report online within seconds. The software provides nationwide criminal and eviction history, as well as a full credit report with FICO and the option to include a decision model. This gives users the security of knowing the history of each tenant they place (as well as if they have had challenges paying bills in the past). With no hidden fees, setup or onboarding costs, and no long-term contract, CICTotal Manager™ is the most cost-effective platform for landlords and property management firms. Pricing is based on the number of units in a subscribers portfolio, with tenant screening provided by CIC at a discounted price. Since 1986, CIC™ has provided property management companies excellent service and quality information, and extends this commitment to all CICTotal Manager™ subscribers. CICTotal Manager™ offers unlimited access to U.S. based customer support and 24/7 technical support. In celebration of the new launch of their property management software, CIC™ is raffling off a $100 Visa gift card until March 16, 2018. To enter the giveaway, visit http://info.cicreports.com/cictotal-manager-launch-contest.